The U.S. Department of Education has awarded NIU’s Center for Southeast Asian Studies (CSEAS) two four-year grants totaling $2.4 million, up 45 percent from $1.7 million the center received in 2006. The highly competitive grants were awarded under Title VI of the Higher Education Act, which gives funding to educational institutions every four years to promote the study and research of world languages and cultures. This is the fourth time CSEAS has received such funding since its designation as a National Resource Center (NRC) for Southeast Asian Studies in 1997. The center, which will celebrate its 50th year at NIU in 2013, received 13 percent more in its NRC project funding for programs and operations, totaling $1,009,144, over the next four years. The second project through Title VI dramatically increases—by 75 percent—the funding allotted to the center’s administration of Foreign Language and Area Studies (FLAS) fellowships, totaling $1,446,000 over four years. These fellowships are awarded competitively to NIU graduate and (for the first time this year) undergraduate students studying Southeast Asian languages at NIU. NIU currently offers Burmese, Indonesian, Khmer, Malay, Tagalog and Thai, with Vietnamese planned to be added in 2012. This year, the center is awarding 14 FLAS fellowships for graduate students and three fellowships for undergraduate students, seven more fellowships awarded than in the previous year. 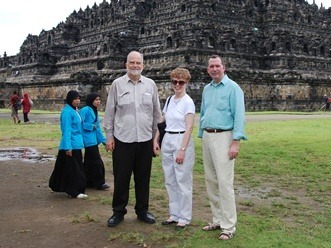 Tuition waivers from the Graduate School have allowed the center to leverage FLAS funding to offer more fellowships to more graduate students, said Collins, a linguist who came to the center as director in August 2008 from the National University of Malaysia. “I think that significantly strengthened our proposal and that’s why we got a 75 percent increase,” he said. The center competed for Title VI funds with seven other National Resource Centers at Cornell University and the universities of California (Berkeley), Hawaii, Michigan, Ohio, Wisconsin and Washington, Collins said, emphasizing that the Education Department considered the grants not “renewals,” but essentially first-time proposals. In that light, he said, the increases were especially significant, noting that the center’s 45-page NRC grant proposal received a 96 percent approval rating from the department’s independent, anonymous reviewers. The FLAS proposal received a 95 percent rating. President John Peters praised the center’s continuing efforts to expand student opportunities and deepen academic ties with Southeast Asia at an Aug. 16 reception celebrating the new grants. “It’s an important region in and of itself, and we have a special role here at Northern Illinois University to attract students here, educate them and get them ready to contribute globally, particularly in that part of the world where we have a special relationship,” Peters said. Also speaking at the reception, College of Liberal Arts and Sciences Dean Chris McCord, who traveled with Collins to Indonesia in 2009 as part of a U.S. State Department education mission to expand academic links with that country, noted that NIU clearly has “a seat at the table” providing high-level expertise and insight into the entire Southeast Asia region. An interdisciplinary center, CSEAS is affiliated with more than 13 departments on campus and includes 33 faculty associates on its center council. It offers an undergraduate minor and a graduate concentration in Southeast Asian studies, and is working toward establishing an undergraduate major. In addition to these Title VI grants, the center also has secured another Title VI Education Department grant—for $534,000—to develop an innovative multimedia Malay-English dictionary for online learners that will be housed at SEAsite, the center’s Web-based collection of materials on Southeast Asian languages and cultures. This fall and spring, the center will host two groups of Southeast Asian high school students participating in the second round of its Southeast Asia Youth Leadership Program, which is funded solely by a $280,000 grant from the U.S. State Department’s Bureau of Educational and Cultural Affairs.